To celebrate their 20th Anniversary, IDW Publishing is releasing special one-shot stories across multiple properties, set either 20 years in their future or 20 years in their past. As Editor-in-Chief John Barber explained, “An anniversary like the one IDW is celebrating is a cause to look to the future and the past.” Among January’s offerings are adventures set in the universes of Ghostbusters, Jem and the Holograms, My Little Pony, Teenage Mutant Ninja Turtles, and (of course) Star Trek. 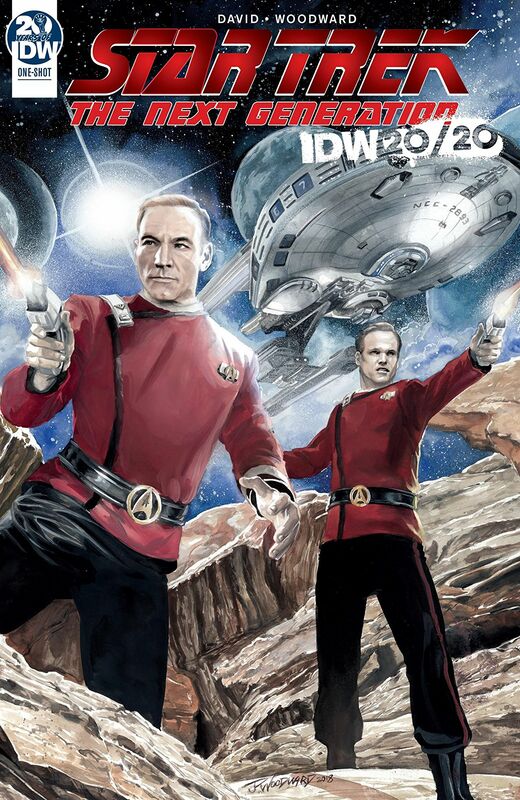 Written by Peter David with art by J.K. Woodward, Star Trek: IDW 20/20 is set 20 years before “Encounter at Farpoint,” with a newly-promoted Jean-Luc Picard just having taken command of the USS Stargazer. But unbeknownst to him, first officer Commander Jack Crusher has invited his fiancée, Cadet and Doctor Beverly Howard, to accompany him on the ship to their next destination, where she will catch a transport back to Starfleet Academy. But of course, new orders have come in, diverting the Stargazer and its unannounced guest, and Captain Picard is not happy about having a stowaway on his ship. Peter David has long been a favorite in the Picard/Crusher community, as his novels regularly include more P/C “shipping” than most of the pre-Nemesis books (Q-Squared is a personal favorite), and this story does not disappoint. Aside from a few quick conversations and flashbacks during the series and the TNG novel Reunion by Michael Jan Friedman, we don’t know much about Picard’s time on the Stargazer or his relationship with Jack and Beverly Crusher. Most of what we do know surrounds the events leading to Jack’s death. This story, however, details the first meeting of the Captain and the Doctor, and it’s rather different from the headcanon that I’ve established over the last 30 years thanks to a voracious appetite for fanfiction. So, back to the content: This story moves rather quickly (of course it does – there’s just one issue), which at times makes the main conflict feel less “high stakes” than the promotional material would have one believe – or maybe that just wasn’t the part of the story I showed up for. I’m here for these characters. In this book, we find a slightly different Jean-Luc Picard than we’ve come to know on The Next Generation – including a rather unfortunate assumption that Beverly will take Jack’s surname name when they marry… even though she does. Picard’s struggling with how his crew will perceive him if he appears too cautious or vulnerable while in command, which we only caught glimpses of in TNG (see Season 2’s “Samaritan Snare”). However, we also meet a young cadet in Dr. Beverly Howard who is not afraid to talk back, speak up, or hold her own against a captain – perhaps acting a bit more obstinate than in their future battles over the Prime Directive. Overall, this is a fun little peek into the past for details about some of my favorite characters, and my absolute favorite Trek relationship, all in a lesser-explored era of the Star Trek universe. Star Trek: IDW 20/20 is a one-shot, released on Wednesday, January 30, 2019 and can be found online or at your local comic book store. Visit Comic Shop Locator to find a store near you.